You will want for nothing in the luxuriously and tastefully decorated apartments. In the fully equipped and modern kitchen you can easily prepare a wonderful meal, which you can conclude with an espresso or cappuccino from the Nespresso machine. Enjoy the digital television content on the large flatscreen or the use of the high-speed wireless internet. Naturally, you can enjoy a nice drink on your private terrace/balcony as well. A private parking space will be at your disposal and there are special lockable areas for storing bicycles or, for example, your golf equipment. 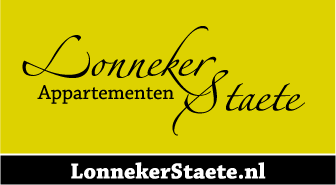 Lonneker Staete apartments are smoke-free, accessible for the disabled, and pets are, after prior consultation, allowed. Thanks to our special switchboard you can easily make and receive calls in your apartment. Below the apartments is a small supermarket where you can do your grocery shopping. What is special about this supermarket is that the staff consists of mentally challenged people, supervised by the local care institution. They will do anything to help you as best they can. We especially recommend the freshly baked buns in the morning. Do you have a question about the apartments or do you want a quote? Please contact us by phone +31 (0)53 20 30 940 or send us an email.